Intimate, inviting and downright dreamy, Villa Bren was designed with couples in mind. Whether you’re in St. Barth for a honeymoon, anniversary, proposal or no reason at all beyond being in love with the island and your companion, the property is a romantic cocoon of comforts and lets you focus on each other. The luxury rental home was recently renovated. It’s decorated in a modern-Caribbean style, with clean-lined furnishings, muted tones and exotic woods, similar to the look of the much larger Villa Johnson next door, with which it can be rented together. Of course, the real decoration is the scene outside, seen through the broad glass doors on two sides of the bedroom, the azures and turquoises of the sky and sea—you’ll wake up to sunlight dancing on the water of Marigot Bay. 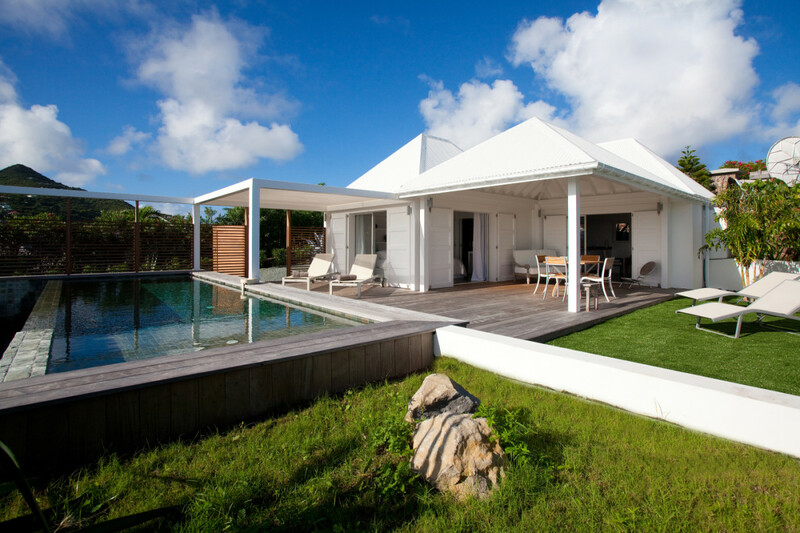 Villa Bren location in the exclusive enclave of Mont Jean enhances its privacy. Along with the beguiling bedroom, the villa includes a cozy living area with a sleek kitchen and barstools on one side. But life here unfolds mainly outdoors: in the long infinity-edge pool, lounging on chaises in the sun, relaxing on the daybed or dining at the table on the broad terrace. Our concierge can arrange romantic activities such as wine tasting or couples massage, or most anything that would make your time together all the more special.